Iran pledged that its “axis” with Syria will “never” be allowed to break when Tehran sought to bolster President Bashar al-Assad by sending a senior envoy to Damascus. I have been warning for some time that because Iran and Syria are close allies that they will likely stick together for a while, and also may end up fighting with Israel and/or the USA. 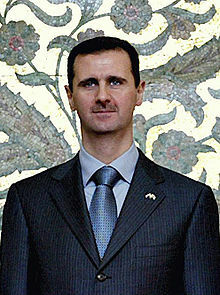 The statement from Iran today is intended to reassure Syria’s Assad of Iran’s support. I remain of the opinion that Iran wants Syria to cooperate with it in the event of a regional conflict involving Israel and/or the USA. Since Iran will not be the King of the South and Syria apparently will support the King of the South (Daniel 11:40-43), the situation in those countries will change–and this certainly could happen from civil unrest and/or a regional conflict. This entry was posted on Tuesday, August 7th, 2012 at 1:10 pm	and is filed under Prophecy.